These round banquet tables are in stock and ship out the same day, Monday through Friday, if ordered in the morning. Also available in 5-packs. 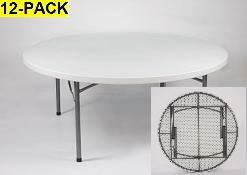 We also have the Lifetime model 42673 72" round tables 42673 - a 4 pack of Round 72 Inch Tables with discounted shipping. ATC Round Tables include a superior frame offering support and protection around the edge - not found in most brands. Excludes the intrusive H-frame braces that connect leg pairs. Ideal for Weddings, Banquets, Church Activities, Office, Rental Groups, Crafts, Outdoor Activities and More! This item is available for quick ship. Ships from California and takes about 7 business days coast to coast. We ship via LTL Freight carriers such as ABF or Roadway. Freight company calls to schedule a delivery appointment once it reaches your local terminal. If a loading dock is not available please note that customer is required to help driver unload them one by one. Round Folding Tables for sale in this listing are excellent for banquet halls, churches, schools, and offices. Round tables are very useful when eye contact and personal interaction among all those seated is desired. Rectangular banquet tables tend to lead to opposing sides being separated from each other; but, round tables allow easy interaction between everyone at the table. Q: Can we just order 2 tables? A: Yes, you can order single tables. Simply search for the model number "BT-71R" without quotations and it will pull it out for you. Fast Shipping: Orders for the National Public Seating Bm-71 (12 Pack) generally leave the warehouse within 2-4 business days. Delivery Details: This product ships directly from the warehouse in Clifton, NJ. This item generally ships via a curbside delivery through an LTL carrier (too big for UPS and FedEx). The customer must be present to sign for the order. The freight carrier is instructed to contact you prior to delivery to set up a delivery appointment. Dimensions: 71" x 71" x 3"